The trip to Belo Horizonte was mostly about being with family, but since it was the boyfriend’s first time there, we had to take him to all the touristy places. Praça do Papa (Pope Square): A plaza where the pope celebrated mass in 1980, with views of the south end of Belo Horizonte. Mirante do Mangabeiras (Overlook): the panoramic views from the top of Serra do Curral were one of my favorite things growing up. Now they renovated the area and there is a nice overlook with benches to watch the sunset. Mercado Central (Central Market): this is a huge marketplace downtown, where you can buy meat, fruit, flowers, tea, cheese… There we saw the boyfriend’s new favorite fruit: cajú (cashew fruit) and tasted cachaça (Brazilian rum). Believe it or not, it was my first time there. I didn’t even know that it was covered and that they had a parking lot, just like in a mall. Palacio das Artes (Arts Palace): this is a beautiful modern theater downtown, but when we went there, they were closed and all we were able to see was the arts and crafts store, which had lots of artwork from Minas artists. 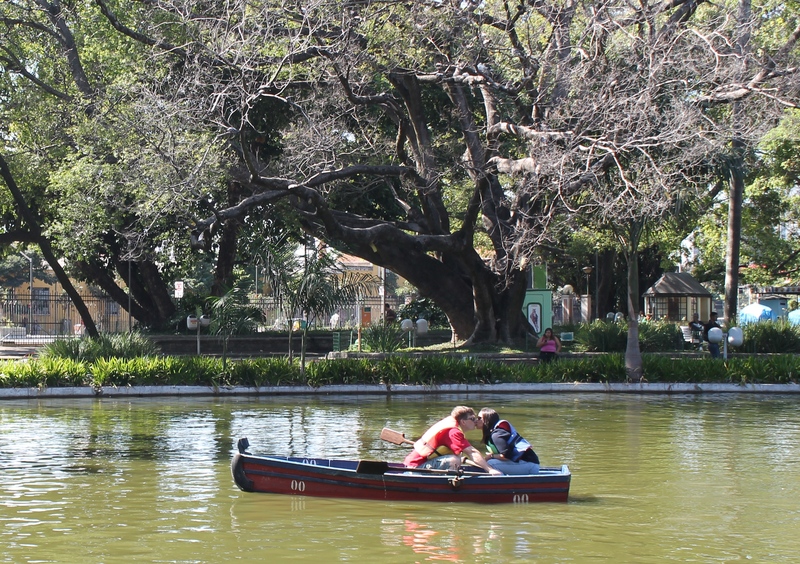 Parque Municipal (City Park): The “Central Park” of Belo Horizonte is actually beautiful, full of trees, a small amusement park, and a lake. The boyfriend and I went on a canoe ride while my mom took pictures of the lovebirds. Igreja da Pampulha (Church): on the north part of town, this church is one of the most famous sites of Belo Horizonte because it was built by architect Oscar Niemeyer. Controversial at first, the church has an organic modern style and an altar mural by artist Candido Portinari. Lagoa da Pampulha (Lagoon): this lake and its surroundings were also designed in the 40’s by Niemeyer. Now it’s a little polluted but the 18km trail around it is still nice. Mineirão (Stadium): Belo Horizonte was one of the World Cup host cities. The infamous game Brazil vs. Germany, with Brazil’s epic loss of 7-1, was played here, so I’m not sure it is a very lucky place.